We’re happy to present our last Flashback Friday post of 2011. Hope you’ve all had a great year so far enjoying the games, friends and fun facts of FunGoPlay! Today we look back on Knute Rockne, one of the greatest coaches in college football history. Aside from having an AWESOME name, Rockne is known for making the forward pass popular. Yes, if you can believe it, back in the day the game of football was all about smashmouth running games! This was back in the day when running backs like Red Grange were the kings of the game. As coach of the school, he led Notre Dame in a 35-13 crushing of heavily favored Army thanks to an unsuspecting torrent of forward passes. 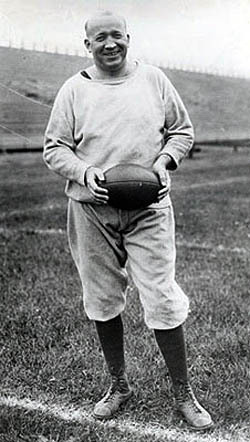 Knute Rockne finished his 13-year coaching career with Notre Dame with 105 victories, 12 losses, five ties and three national championships, including five undefeated seasons without a tie. Hope you’ve enjoyed this Flashback Friday. We can’t wait to see you in 2012 and hope you have a very happy New Year! Posted by fungoplay on December 30, 2011 in Flashback Friday and tagged college, college football, flashback friday, forward pass, history, knute rockne, notre dame.